Using large colourful balloons to decorate is an easy enough idea. They don’t cost much and take up quite some space, saving you the trouble of additional decor. The best way to use old wine bottles is as candle stands or flower vases! Gather up all those wine bottles from your bachelorette and get to work! You can paint / decorate the wine bottles in some fun ways. Feel free to use mason jars or other bottles instead, if you don’t have wine bottles. What a whimsical, vintage vibe, they add! Just place them aesthetically around the venue. Okay, this can’t get simpler. Fairy lights aren’t expensive at all. Just get enough and string them all over your venue. They also add a nice, warm mood to the event. Obviously, they only work for an evening event. Look how pretty they are! 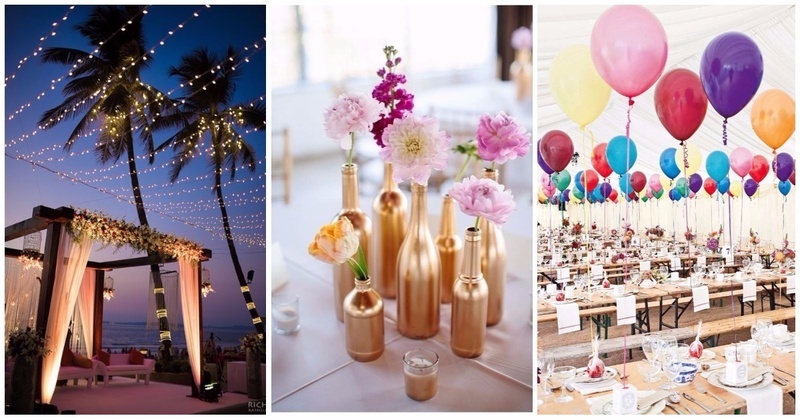 Instead of spending a bomb on fancy centrepieces, just go for ones that can be functional as well. Edible centrepieces wouldn’t get wasted either! Fruit-based centrepieces, chocolate centrepieces or even cupcake towers are all good ideas.